It may come as a surprise to find a Greek Orthodox parish comfortably established in the middle of northeast Louisiana, but in fact the doors of our church have opened onto Monroe and its surrounding areas for over half a century, and we look forward to building on that legacy in the years to come. 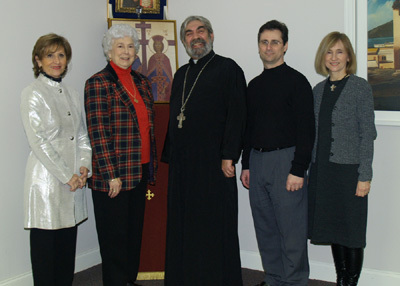 A parish under the jurisdiction of the Greek Orthodox Metropolis of Atlanta, we are a small but active community of Orthodox faithful dedicated to upholding the great spiritual tradition handed down to us from the time of the Apostles and practiced today by more than 250 million Orthodox Christians worldwide. After an extended period without a permanent spiritual director, we feel truly blessed to be able to welcome into the Sts Constantine & Helen family Fr. Dimitrios Leussis, whose assignment to this parish by His Eminence, Metropolitan Alexios came as the answer to many prayers. As we joyfully resume a normal schedule of worship services, we are full of gratitude for the longstanding support of Frs. Teodor Bita and Theoharis Theoharis from Holy Trinity and St. John the Theologian Church in Jackson, Mississippi, and of Fr. Brendan Pelphrey from St. George parish in Shreveport. Under their gentle guidance, this church never closed its doors in seven years without a priest in residence. We thank them for devoting so much time and energy to our parish, despite their very busy schedules at home, and ask for their continued prayers on our behalf. Looking to the future, then, we greet Fr. Dimitri with great enthusiasm and pray that his arrival will mark the beginning of an exciting new era for this parish. Whether you are an Orthodox Christian arriving in the Monroe area and looking for a new parish to call home, or a non-Orthodox Christian interested in learning more about our Faith–and your own Christian roots–we invite you to explore this website, contact us, or just pay us a visit. We would welcome the opportunity to get to know you and to have you get to know us!